This week’s Top Ten list from The Broke and the Bookish is so easy that I could not resist. They ask you to list the top ten books collecting dust on your shelves. The ones that have been there forever, but you just have not gotten around to reading. You can share your own top ten by clicking here. I’m a perpetual trader in of books, but even I get behind sometimes. Or do battle with that nagging belief that I’m going to read that book…someday. Just not today. It’ll be interesting to see what the books we just haven’t gotten around to reading say about us. Are these books a reflection of the book-reader we would like to be, but just aren’t? Who knows. 1. 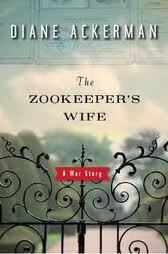 The Zookeeper’s Wife, by Diane Ackerman. This wins for having been there the longest. So long that I can no longer remember where it came from. I’ve heard good things about it, but…. 2. I Didn’t Do It For You: How the World Betrayed a Small African Nation, by Michela Wrong. This is definitely a book about who I would like to be…someone who knows something about small African nations. 3. Turn of Mind, by Alice LaPlante. To be fair, this hasn’t been sitting on my night stand for very long. And it’s a library book, so it won’t sit there very long. I don’t know if it’ll get read, either, though. 4. When You Are Engulfed in Flames, by David Sedaris. A gift from a friend. I know many people find David Sedaris hilarious, I’m just not sure if I’m one of those people. 5. The Body Project, by Joan Jacobs Brumberg. Lent to me by a friend. I hope she hasn’t noticed it’s missing. Of course, I have to read it. I know I’ll like it. And yet. 6-8. Waiting, by Ha Jin; Broken Verses, by Jamila Shamsie; The Hakawati, by Rabih Alameddine. I group these together because I suspect this tells me that I’d like to be the kind of person who reads more global fiction, but that I seem to not want to actually read global fiction. 9. So Much Pretty, by Cara Hoffman. I didn’t pay for this book, at least. 10. Object Lessons, by Anna Quindlen. This was also used. If we pay less for a book, do we feel less compelled to read it? So, now I’m hoping everyone will explain to me in great detail why I should definitely, without a question, read some of these books. What books have been wasting away on your shelves?